My second lesson of the day was a regular private class, where we have been focusing primarily on the three transitions and four postures. Today we covered this again in our warm-up, but ended up focusing on the v-step footwork and some dirty boxing. 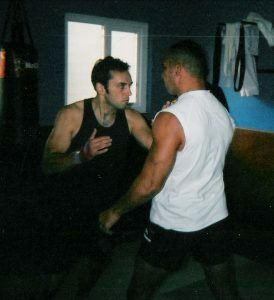 I was first taught the v-step in Tony Hayes’s Muay Thai. Its particular relevance cropped up in the Thai clinch. I later correlated with angling off in wrestling during my time training with Matty Evans and then with Braulio Estima. I trained briefly in Tommy Thompson’s excellent TVP Western Boxing programme, where I learnt far more sophisticated footwork patterns. The v-step cropped up again and I have taken particular note of the way the great Willie Pepp used this movement along with the L-step. We did a lot of work going backwards and forwards with the v-step, taking a boxing view then a Muay Thai view then a Wrestling view and finally an MMA view. We looked various places where the movement complimented simple combinations and takedowns. Next we looked at combining lead hand trapping with punching, taking Roberto Duran as our inspiration. Finally we combined trapping, punching, kicking and clinching with a constant flow of v-stepping. This was then taken onto the focus onto the focus mitts.